I have a special attachment to the deserts of California, in particular Yucca Valley. When I was young, my father bought a few acres of land out there and had this dream of building a house in the middle of nowhere. He would load up our family in an old Landcruiser jeep he had refurbished and drive us out there to do donuts around shrubs and dry lake beds. I'd like to say I looked forward to it and loved it for the grand adventure it was. But the truth is, my brother, sister and I were mostly sullen about it. It was a long drive, we wanted to stay home and watch TV, read our Sweet Valley High books. Sunsets were boring, and we were teenagers. I learned much later that my father's attachment to this strange piece of land arose out of his desire to return home. He was born and raised in Karachi, and gave up his Pakistani citizenship for a new life in America. The house in the desert was both a pipe dream, and a recovering of the past. We lived in the suburbs of LA, but the desert was the place that most called to him. On a recent trip to California, I spent the day driving out to Yucca Valley. It's changed a lot since the 90s. There are tracts of suburban style homes out there now. But the state parks and unpaved dirt roads remain as they ever were. After living abroad for many years, I find driving out to the desert reassuring. The endless stretches of road on the 60 East and State Route 62 instantly drop me back into an American state of mind. I look at the occasional tumbleweed caught in the undercarriage of speeding cars and feel a bit of regret — for those years when I would not allow myself to enjoy this place — but also deep satisfaction, knowing that like my father, I return to it because it always brings me closer to home. I wanted to experiment with some high speed black and white film, so I got my hands on a roll of Ilford Delta 3200. Unfortunately the highest ISO my Mamia registers is 1600. So I set it at that and exposed down a full stop, then had the developers push process it. That's all kind of technical and boring. The more interesting stuff is being able to shoot in really low lighting conditions. I mostly shot landscapes in the early evening around Wellington. The results are pretty contrasty. I don't mind the look, it's great for making everything gritty and noirish, but my portraits turned out a bit soft and blurry, so I probably should have used a tripod. It seems a single small light source is not quite enough light. But low ambient levels work well enough. I have one more roll, I'll need to think on a better strategy. Last Christmas involved a road trip through Glacier Country. I finally got around to developing the film and was surprised by how unusual and desaturated the colors look. I went back and took a look at the film which is from a pack of Agfa Optima 200 rolls that expired in 2006. Expired film is like this great black box, you never quite know what you'll end up with. I only have one roll left, I better make it count. more from the expired film treasure trove. 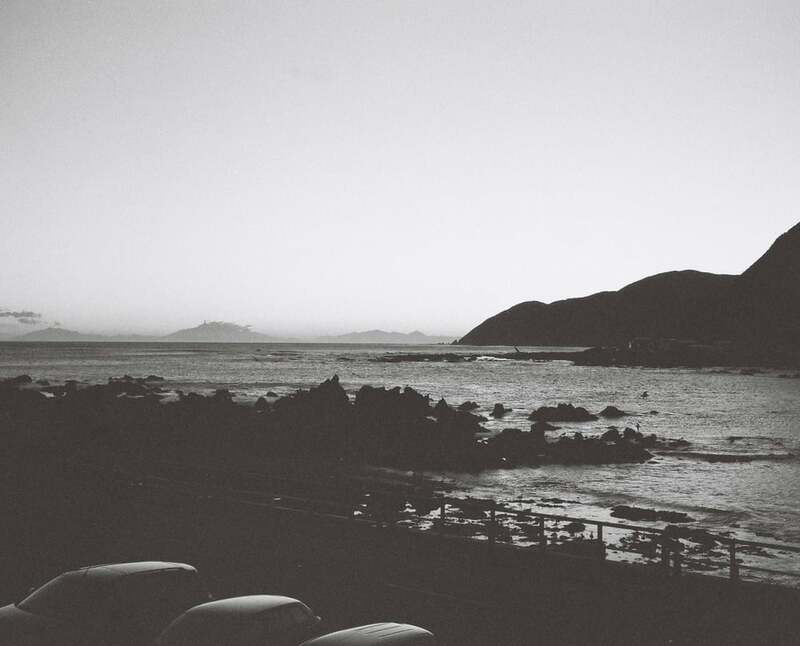 There's no doubt that Wellington is one one of the most scenic cities around. Over time however, I find myself becoming immune to its charms. Oh another great sunset. Unsullied beaches? That's nice. I haven't spent very much time shooting black and film so I thought I'd experiment with this Ilford Delta 400. It's a bit fast for bright light, but works quite nicely on the overcast days. It's also allowed me to stop and smell the salt water as I drive around the bays.